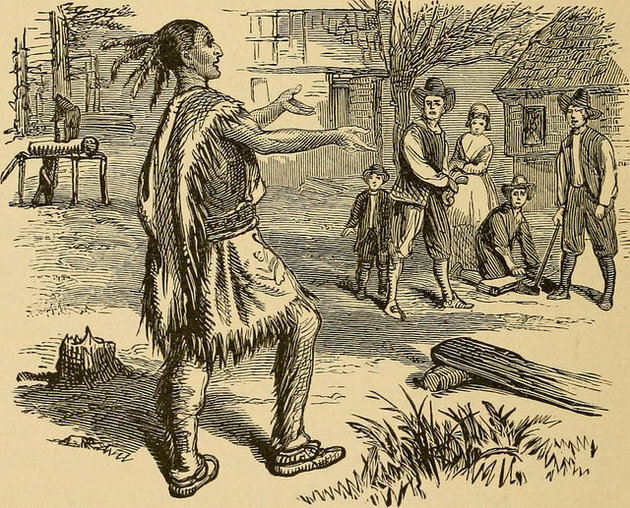 English Pilgrims, seeking religious freedom, landed in Plymouth, Massachusetts, where they found a rich land full of animals and were greeted by a friendly Indian named Squanto, who taught them how to plant corn. In 1614, six years before the Pilgrims landed in modern-day Massachusetts, an Englishman named Thomas Hunt kidnapped Tisquantum (a.k.a. Squanto) from his village, Patuxet, which was part of a group of villages known as the Wampanoag confederation. Hunt took Tisquantum and around two dozen other kidnapped Wampanoag to Spain, where he tried to sell them into slavery. But Tisquantum escaped with the help of Catholic friars, then somehow found his way to England. He finally made it back to what is now Massachusetts in 1619. As far as historians can tell, Tisquantum was the only one of the kidnapped Wampanoags ever to return to North America. But while Tisquantum was in Europe, an epidemic had swept across New England. There had been a shipwreck of French sailors that year on Cape Cod who had introduced an infectious disease, perhaps viral hepatitis, to the native peoples. The infection spread quickly, wiping out whole villages. When Tisquantum returned to Patuxet, he found that he was the village’s only survivor. Into this disaster bumbled the Pilgrims. They showed up in New England a few weeks before winter and promptly began starving. Up until the Pilgrims, the pattern had been pretty clear. Europeans would visit the Wampanoags who would be interested in their trade goods, but were really uninterested in letting Europeans permanently occupy the land. Often, armed native people would force Europeans to leave if they attempted to stay too long. This time, the Europeans wanted to stay, and the disease that had decimated Patuxet ensured that they had a place to settle. When the Pilgrims arrived in Patuxet, they found cleared land and the bones of what they assumed were savages. They called it Divine Providence, believing that God had killed these pagans so that Christians could live on their land. The graveyard of Tisquantum’s people became Plymouth Colony. Meanwhile, Massasoit, a local Wampanoag leader, looked at Tisquantum and smelled trouble. Massasoit kept Tisquantum under what was essentially house arrest until the Pilgrims showed up hungry and clueless. Patuxet wasn’t the only native village decimated by the plague. The entire Wampanoag confederation had been badly hit — as much as 75 percent of the Wampanoag population was wiped out. But the Narragansett, a rival neighboring group, basically weren’t affected by the disease at all. That put the Wampanoag in a precarious strategic position. But Massasoit had an idea to save his people. He would forge an alliance with the new settlers. On March 22, 1621, Massasoit went to meet with the Pilgrims. He brought Tisquantum along to translate, but he didn’t trust him. Shortly into the conversation, Tisquantum, true to his name and reputation, tried to pit the Pilgrims against Massasoit, perhaps in an ill-advised coup attempt. But the plan didn’t work: Massasoit caught onto the plot and demanded that the Pilgrims hand Tisquantum over to be executed for treason. However, the Pilgrims had their own plans for Tisquantum which involved him teaching them how to grow crops so they could survive the next winter. For Tisquantum, the choice between working as an agricultural consultant for the Pilgrims or being executed as a traitor by Massasoit was an easy one to make. By their second autumn in the New World, the settlers’ situation was secure enough that they held a feast of thanksgiving. Massasoit showed up with about ninety men, most of them with weapons. The Pilgrim militia responded by marching around and firing their guns in the air in a manner intended to convey menace. Gratified, both sides sat down, ate a lot of food, and complained about their neighbors, the Narragansett. And today, of course, the descendants of both the English and the Wampanoag are still around. For further reading, see 1491: New Revelations of the Americas Before Columbus by Charles C. Mann. Second edition published 2006 by Vintage. Also see the website put together by Mann. This historical account has been adapted by Michael Simms from an article by Nick Baumann published in the Huffington Post which was in turn based on interviews with Charles C. Mann and with Paula Peters, a member of the Mashpee Wampanoag tribe and an expert on Wampanoag history. This entry was posted on November 26, 2015 by Vox Populi in Note from the Editor, Social Justice, War and Peace and tagged Massasoit, Michael Simms, Patuxet, Plymouth Colony, Squanto, The True Story of Thanksgiving, Tisquantum, Wampanoag.